You begin the path towards becoming a runner again when you start to integrate run like movements back into your training program. For those of you who have been in run jail for extended period of time this is a critical phase — and it can’t be skipped. Everybody wants to put their shoes back on and go for a great run, but you can’t. The first step here is essentially re-learning how to run. You do this first through rehab to strengthen and activate muscles. Then you begin the process of putting these muscles to work within the context of running…but without the load of running. What does it mean to learn to run again? You are basically working to you learn the movements required to run properly. In some cases you are trying to undo years of bad habits or compensations you might have had that led to you being in one jail. Most likely your doctor or physical therapist was given you a set of exercises to perform for strength and rehabilitation. You should plan on continuing these well beyond the actually have window as they will sustain your improvement and become a good physical set of cues for you regarding “proper” running. Anyone who’s done this will tell you that the actual cost is more mental than physical. 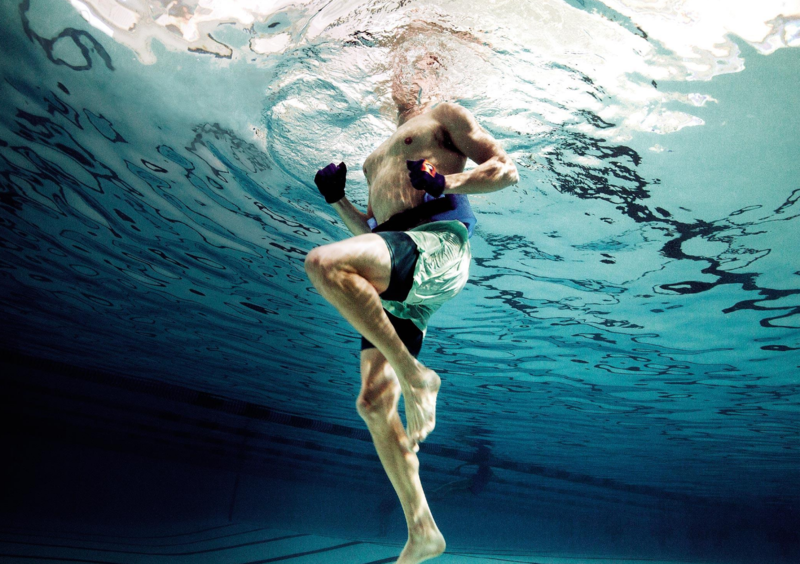 But don’t be misinformed – pool running can still be a fantastic workout. You’ll need a pool that is deeper than you are tall so you do not touch the bottom when you run. Let me repeat that — you don’t want to be bouncing off the bottom when running in the pool. You do not need a belt although some people enjoy using them help flotation. You should run with your arms and your legs simultaneously for increased cardiovascular impact just as you would on the open road. You should focus on bringing the knees up and then pushing the feet straight down again. We do not want you to swing the legs back and forth as though you are cross country skiing. If you’re looking to add additional resistance you can put on short fins that will increase the level of difficulty on your legs. Once you have established your baseline pool running form and fitness, you can start to add intervals. This will help you add some fitness on top of the actual rehabilitation work. These are typically intervals such as 30 seconds hard, then 30 seconds easy. Your pool running workout should be treated just like any other training session. You should have a workout goal and target. You should plan on stretching lightly before you get in the water. You should start slowly to warm up and really focus on the physical cues that you’re trying to integrate into your new running style. Every time that you take a break in the water is an opportunity to reset your head around proper running. If you are looking for a basic schedule, there’s a fantastic nine week plan on Pete Pfitzinger’s website here. Once you have completed several weeks of pool running (usually between four and six weeks) you should be ready to transition to either light running OR to a different run-like modality such as the elliptical! If you have input or feedback or experience with pool running, please share in the comments below! PS – If you are interested in NOT getting injured in the first place, be sure to read my recent interview with Jason Fitzgerald from StrengthRunning.com!